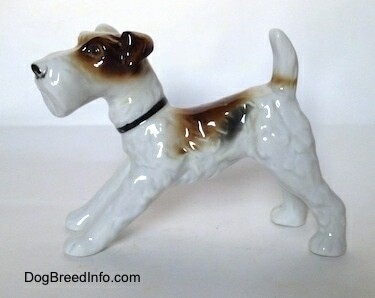 Pictured is a vintage Goebel crown mark Wire Fox Terrier. 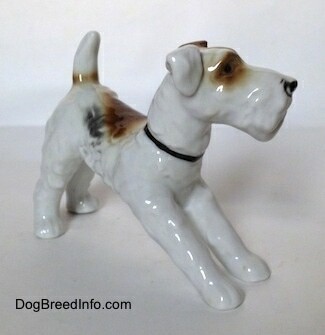 It is of a white dog with black and brown patches in a standing pose with it's tail raised high in an excited position. 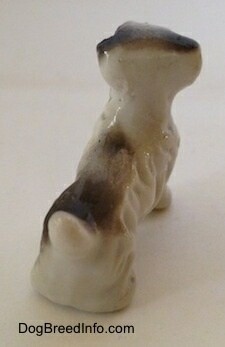 The eyes, nose and tips of the paws are black. 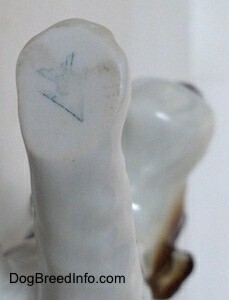 On the bottom of the figurine is the Goebel crown mark stamped in green. There is also a number engraving that reads 20. 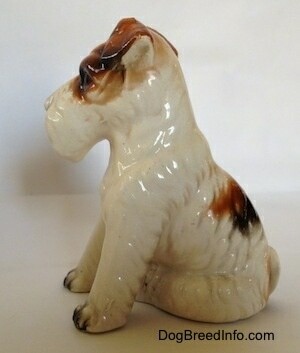 It was made in Germany between 1935 and 1949. 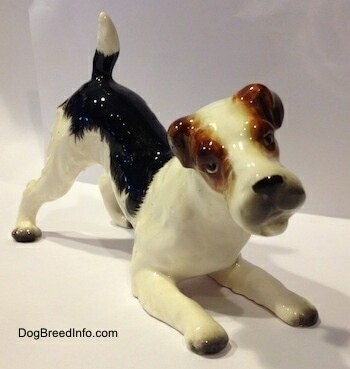 It measures 5 3/4 inches tall from the ground to the highest point of the ear, 7 1/2 inches long from the snout to the back leg and 3 inches wide across the back legs. 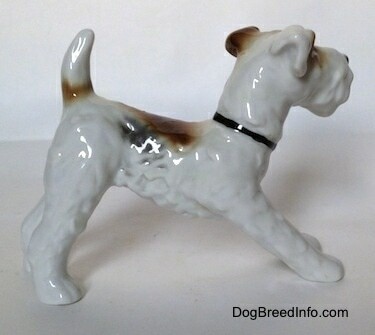 Vintage Goebel crown mark Wire Fox Terrier—image showing the Goebel crown mark stamped in green. There is also a number engraving that reads 20. 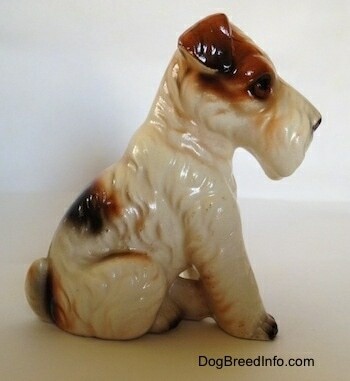 Pictured is a vintage Goebel crown mark Wire Fox Terrier. 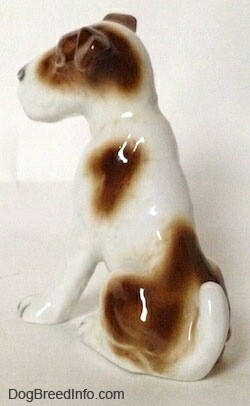 It is of a white dog with brown patches in a sitting pose. 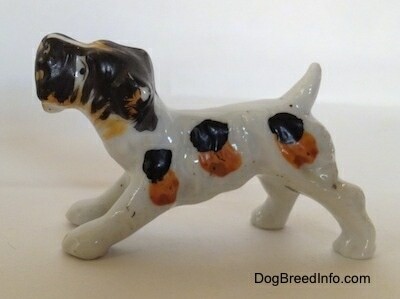 The eyes, nose and tips of the paws are black. 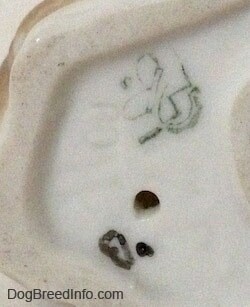 On the bottom of the figurine is the Goebel crown mark stamped in green. There are also two engravings that I believe read 09 and CH 329. 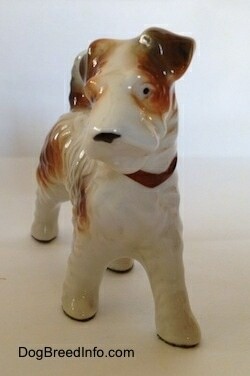 It was made in Germany between 1935 and 1949. 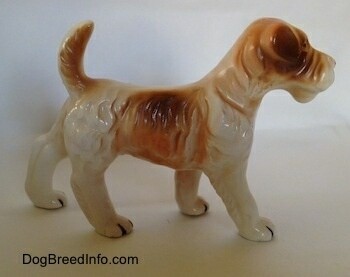 It measures 3 inches tall from the ground to the highest point of the ear, 2 3/4 inches long from the snout to the base of the tail and 1 3/4 wide across the front legs. 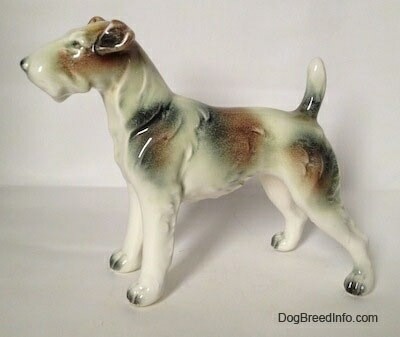 Vintage Goebel crown mark Wire Fox Terrier—image showing the Goebel crown mark stamped in green. There are also two engravings that I believe read 09 and CH 329. 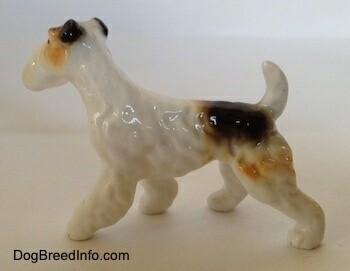 This is an awesome looking porcelain figurine of a Wire Fox Terrier dog by Goebel. 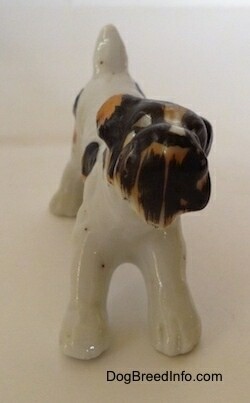 It was made in West Germany during the time period when Germany was split into East and West. 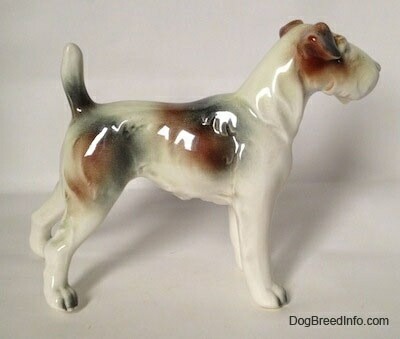 This glossy male dog has the original silver Goebel sticker on the bottom and also a blue stamp. They are both of the bee inside the V positioned above the 'bel' in the name Goebel. Below that it reads W. Germany. 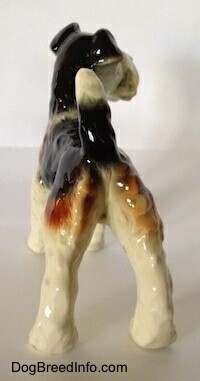 This logo layout indicates the figurine was made between 1972 and 1978. It is what collectors call the trademark 5 (TMK-5). 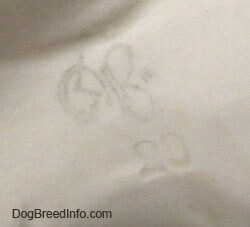 There is an engraved number that is a little hard to read but I believe it says 30303. 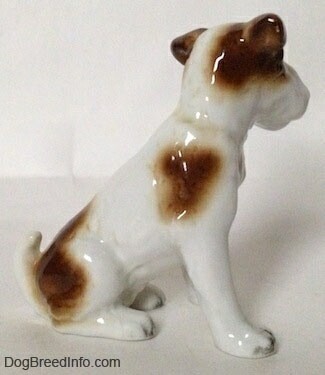 On the front left paw is an engraving of the number 6. 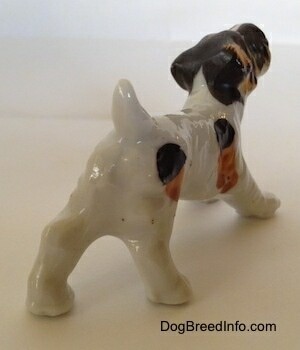 It is in excellent condition with no chips, cracks, breaks or repairs. It does have some crazing. 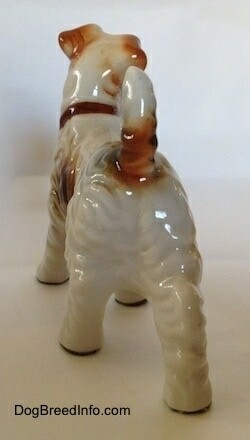 It is 4 1/2 inches tall, 5 1/2 inches long and 2 inches wide. 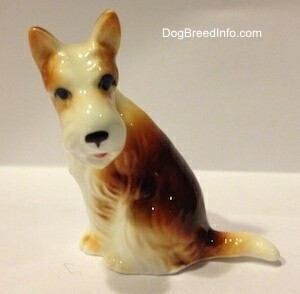 Porcelain figurine of a Wire Fox Terrier dog by Goebel from the 1970s—view of the Goebel sticker, stamp and engraving of the bee inside the V positioned above the 'bel' in the name Goebel. Below that it reads W. Germany. 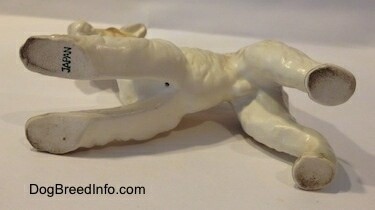 This logo layout indicates the figurine was made between 1972 and 1978. It is what collectors call the trademark 5 (TMK-5). 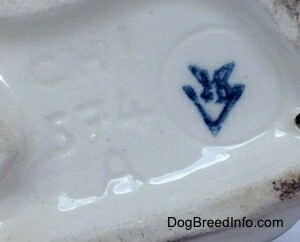 There is an engraved number above the blue stamp that is a little hard to read but I believe it says 30303. 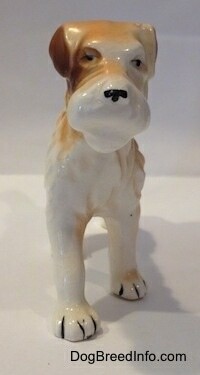 On the front left paw is an engraving of the number 6. 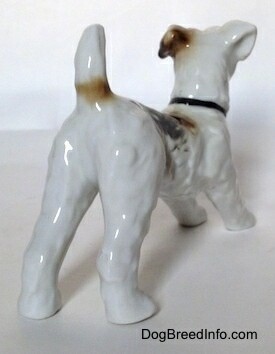 Pictured is a vintage 1950s Wire Fox Terrier dog in a playful pose by Goebel. 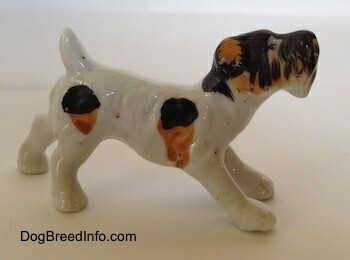 It is white with brown and black markings and a black collar. 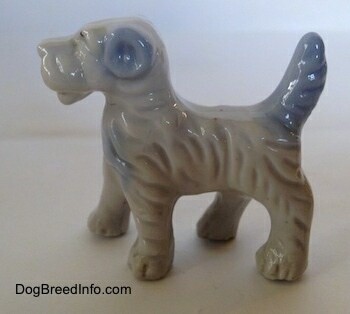 On the bottom of the front left paw is the Goebel trademark 2 (TMK-2) Goebel logo of the full bee inside the V dating the figurine between 1950 and 1956. 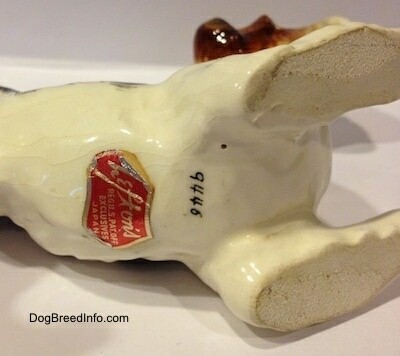 It measures 3 1/8 inch tall from the ground to the top of the head, 4 inches long from the front of the snoot to the back leg and 1 1/2 inch wide across the front chest. 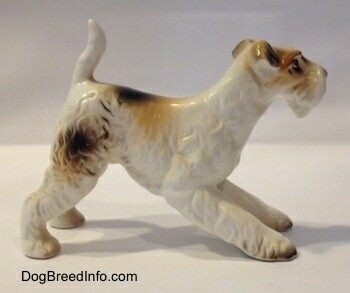 Vintage 1950s Wire Fox Terrier dog in a playful pose by Goebel—image showing the Goebel trademark 2 (TMK-2) Goebel logo of the full bee inside the V dating the figurine between 1950 and 1956. 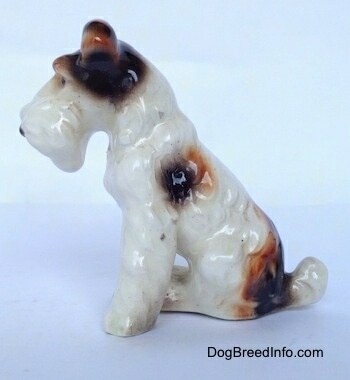 Vintage 1950s Wire Fox Terrier dog figurine by Goebel—image showing the trademark 2 (TMK-2) Goebel logo of the full bee inside the V with an incised circle around it. There is also an engraving that reads CH 574 A. 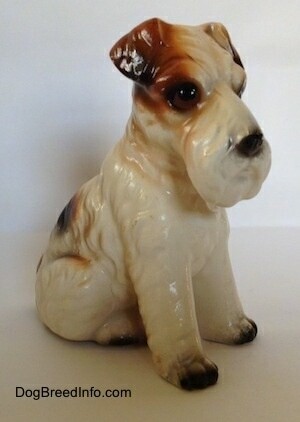 It was made between 1950 and 1956. 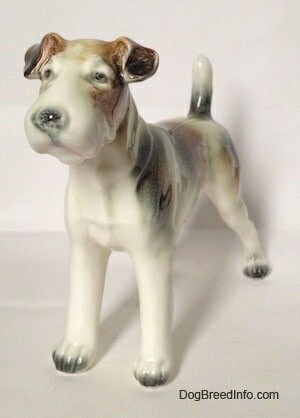 This is a beautiful vintage porcelain Lefton Japan Wire Fox Terrier dog figurine. It has no chips, cracks or repairs. Nice glossy finish. The original Lefton sticker is still on the bottom. 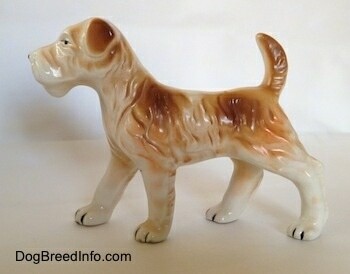 It measures 4 3/4 inches tall and 6 3/4 inches long. The lot number on the bottom says 9446. 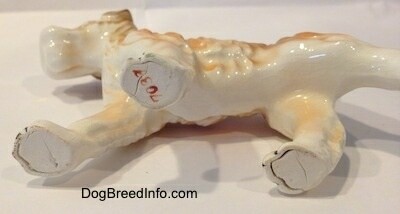 Piece has some crazing on the underside. 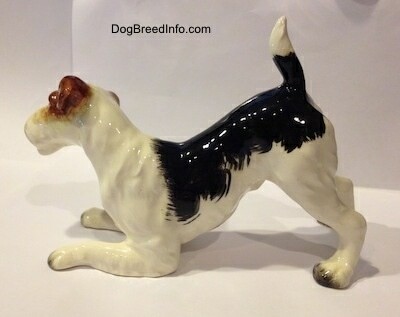 This Wire Fox Terrier is in a play bow pose. 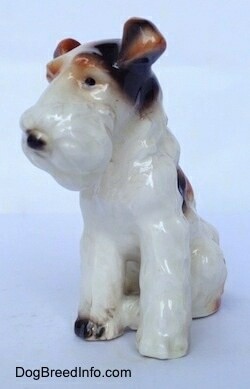 Pictured is a vintage bone china Wire Fox Terrier dog. 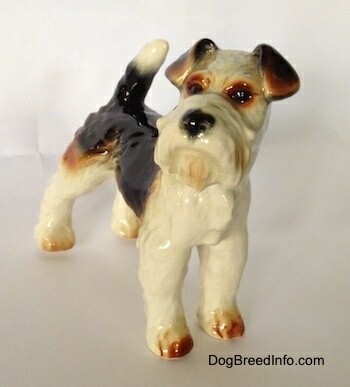 While this Wire Fox Terrier has a breed fault with those perk ears, it is cute all the same. 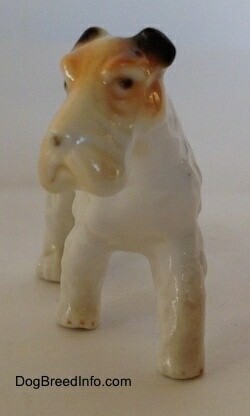 The exact date of the figurine is unknown. It is in perfect shape with no chips or cracks. 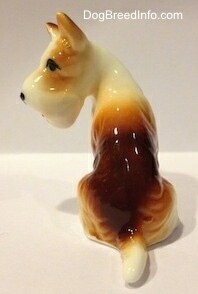 Believed to have been purchased used at a flea market in the 1990s. It measures 1 3/4 by 1 1/2 inch. 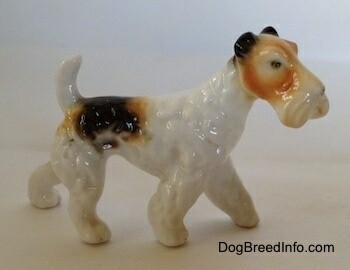 Vintage Wire Fox Terrier bone china figurine—hand painted with the word Japan stamped on the bottom. 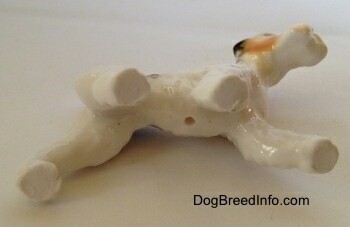 The dog is in a play bow pose and stands 2 inches tall, 3 1/4 inches long and 1 1/4 inch wide. 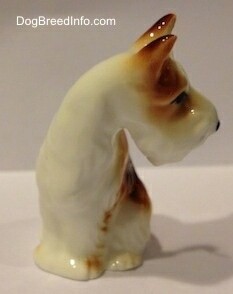 Excellent condition with no chips, cracks, breaks or repairs. 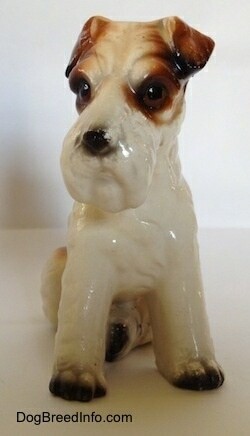 This is a vintage Wire Fox Terrier ceramic figurine. 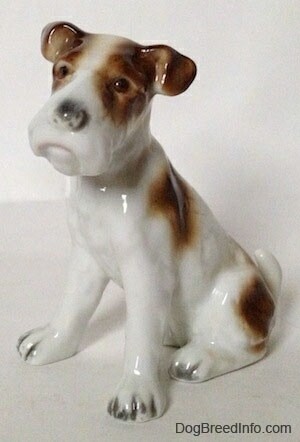 This pup has a low-gloss finish. It is very detailed and realistic looking. 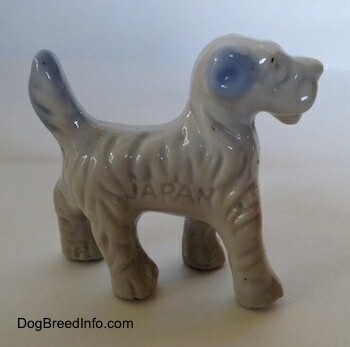 It has Japan stamped on the bottom of the paw. The dog is in a play bow pose. 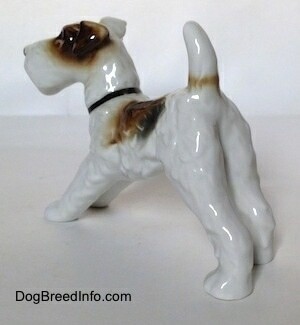 It stands 3 1/2 inches tall from the ground to the top of the tail, 4 1/4 inches long and 1 1/2 inches wide. 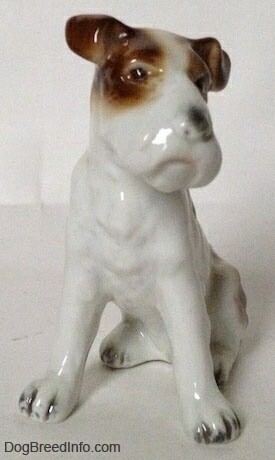 Excellent condition with no chips, cracks, breaks or repairs. 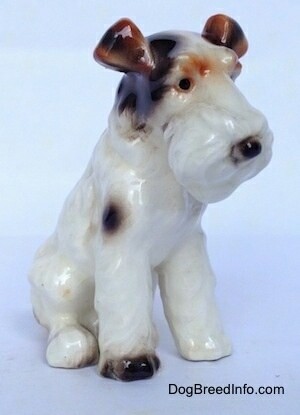 Miniature vintage bone china Wire Fox Terrier figurine—this little dog is nicely detailed with a high-gloss finish. Excellent condition with no chips, cracks, breaks or repairs. 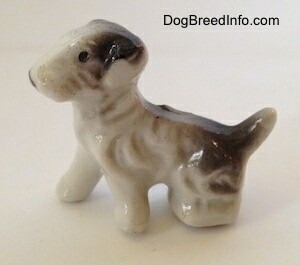 It stands 1 1/2 inch tall, 3 inches long and is 1 inch wide. It is translucent when you hold it up to the light. 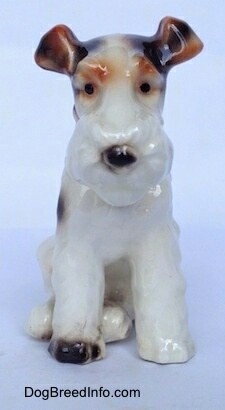 This vintage ceramic Wire Fox Terrier dog in a sitting pose stands 4 inches tall, 4 1/2 inches long and 2 inches wide. It has a semi-gloss finish. 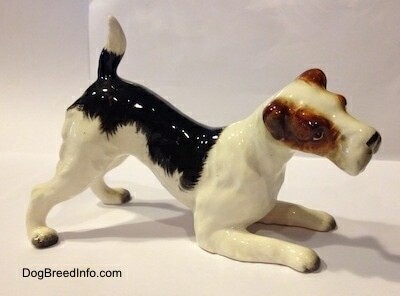 This vintage Wire Fox Terrier figurine in a standing pose has the number 7037 stamped on the bottom of the paw in red. 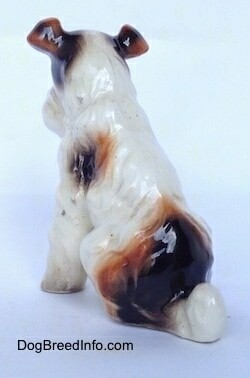 It has some crazing, but is in otherwise good condition. 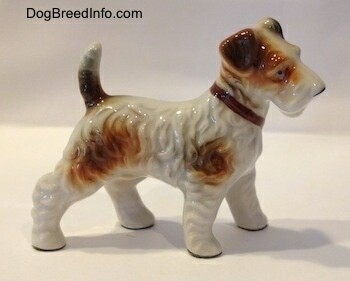 It stands 3 1/4 inch tall, 5 inches long and 1 1/2 inches wide. It has a low-gloss finish to it. 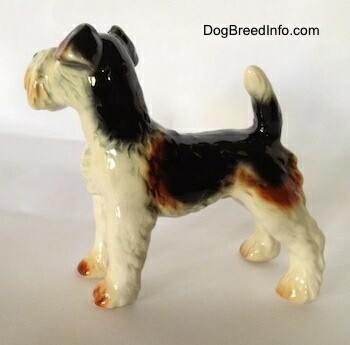 High-gloss vintage porcelain Wire Fox Terrier figurine sporting a snazzy brown collar—this dog is in excellent condition with no crazing, chips, cracks, breaks or repairs. 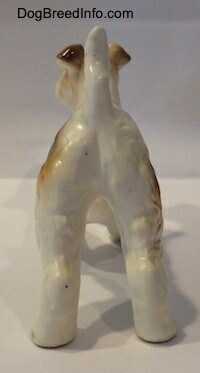 It is in a standing pose. 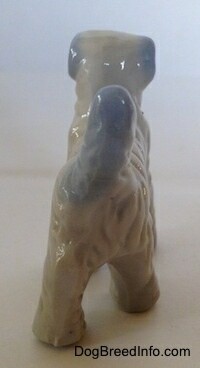 Measuring 3 1/4 inch tall, about 4 inches long and 1 5/8 inch wide. 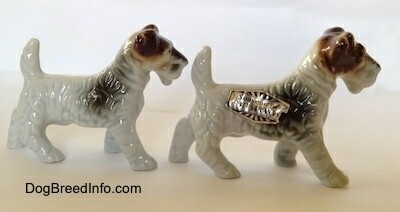 Shown is a pair of vintage porcelain Wire Fox Terrier dogs—these two pups have a high-gloss finish. 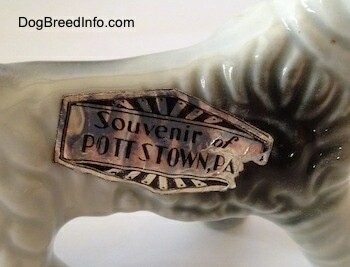 One of them has a sticker on the side of it that reads Souvenir of Pottstown, PA. 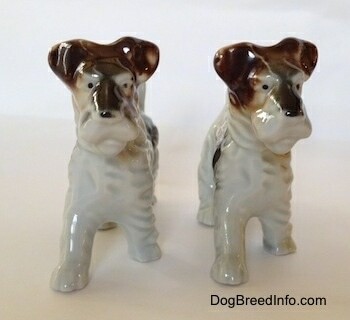 They both have Made in Japan stamped on the bottom. 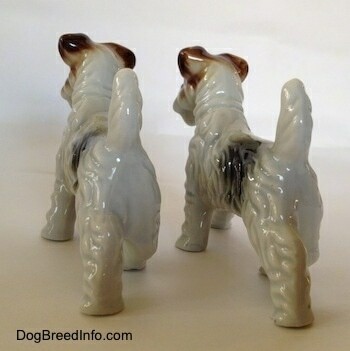 When you turn them upside-down and hold them up to the light you can see they are translucent, indicating that they are not ceramic. 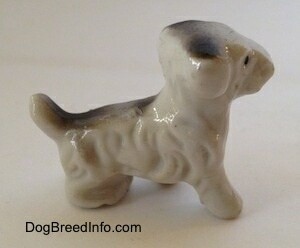 They stand 3 1/4 inches tall, 5 inches long and 1 1/2 inch wide. 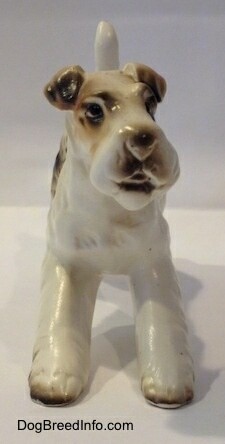 Very good condition with no chips, cracks, breaks or repairs. 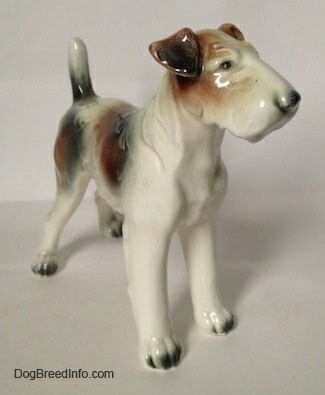 Japanese vintage porcelain Wire Fox Terrier dog—this blue and white little guy reminds me of a block style figurine. 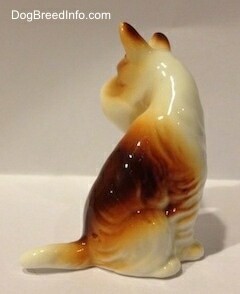 It has the word Japan engraved into the side of the porcelain. 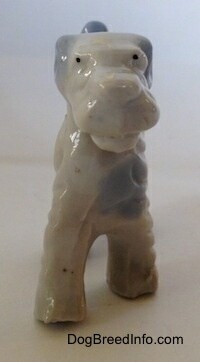 It stands 2 inches tall, about 2 inches long and 1 inch wide. 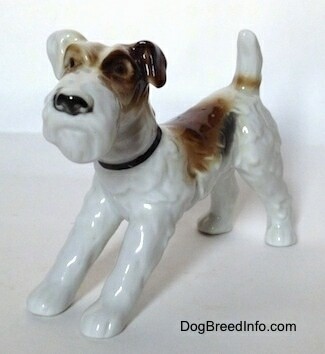 Miniature vintage bone china Wire Fox Terrier puppy—this little guy has the word Japan stamped on the bottom. Translucent when held up to the light, it's in very good condition with no chips, cracks, breaks or repairs. 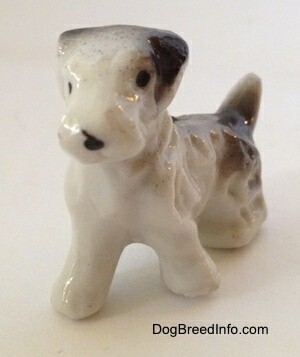 This white and black pup stands 1 1/4 inch tall, 1 1/2 inch long and about a 1/2 inch wide.